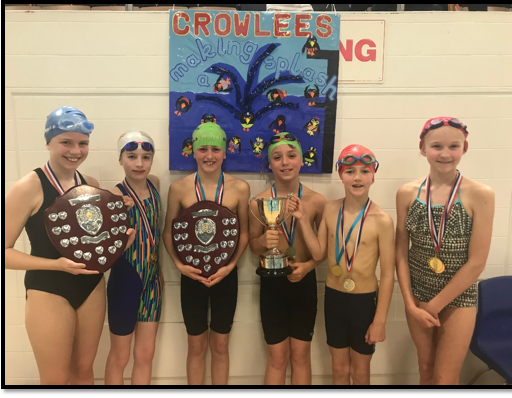 On Wednesday 27th March 2019, the Crowlees Swimming Team attended the Spen Valley Schools Swimming Gala. Our team consisted of 6 children from Years 4 and 6, 3 girls and 3 boys. 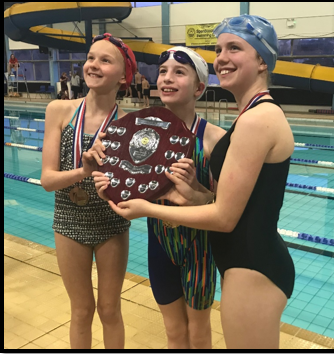 They were competing in breaststroke, front crawl and backstroke. The final race for each team was the freestyle relay. Our team worked incredibly hard and we were delighted that EVERY member of our team managed to progress to the finals of their races. As the evening progressed, we were even more proud to see Poppy win gold in the girls’ breaststroke, Oliver win 4th in the boys’ breaststroke, Eleanor win silver in the girls’ backstroke, Dylan win gold in the boys’ backstroke, Veronica win bronze in the girls’ front crawl, and finally, Edward win silver in the boys’ front crawl! Already over the moon with our results, both the teams went on to smash their heats for the relays, and then comfortably win their relay finals! What a night! We were exhausted just watching and cheering, so I can only imagine how tired the team must have been! At the end of the gala, we were delighted to receive the ‘Girls’ Team’ award and the ‘Boys’ Team’ award, as well as the ‘Overall Team’ trophy! We are so very proud of the whole team, who not only swam like champions but displayed all the Crowlees Values whilst competing.